Tax Returns: Romney Made $43 Million In Past 2 Years : The Two-Way In 2010, the former Massachusetts governor paid an effective tax rate of 13.9 percent. Romney and his wife also gave $7 million to charity. Republican presidential candidate Mitt Romney, seen at a weekend campaign event in Ormond Beach, Fla., released 2010 tax returns showing he is among the top 1 percent of taxpayers. In releasing details of his tax burden for the past two years, Mitt Romney offered a small window into a vast wealth. The tax records show that the former Massachusetts governor made $42.6 million over the past two years and because most of it came from capital gains, he paid $6.2 million in taxes. That means that in 2010, his tax rate was 13.9 percent, and in 2011, it's expected to be 15.4 percent, lower than many Americans who pay taxes on wages. Romney was pushed into releasing his tax returns this week by a relentless attack from his fellow Republicans. Former House speaker and presidential hopeful Newt Gingrich led the charge by saying that Republican primary voters should have a chance to look at the documents to see if they had a flawed candidate. At first, Romney said he would not release his tax records at all, but after a bruising loss in South Carolina in which questions about his wealth and his company Bain Capital dominated, Romney relented. "The couple gave away $7 million in charitable contributions over the past two years, including at least $4.1 million to the Church of Jesus Christ of Latter-day Saints. Romney's family has for generations been among the Mormon Church's most prominent members. "The Romneys sent somewhat less to Washington over that period, paying an estimated $6.2 million in federal income taxes. According to his 2010 return, Romney paid about $3 million to the IRS, for an effective tax rate of 13.9 percent. "For 2011, Romney estimates that he will pay about $3.2 million, for an effective rate of 15.4 percent. That's in line with his earlier estimates, but sharply lower than the rates paid by President Obama and Romney's closest Republican rival, Newt Gingrich." Obama paid a 25 percent tax rate, while Gingrich paid 31 percent in 2010. Reuters reports that Romney's tax records also show that an undisclosed amount of his money is in the Grand Cayman Islands and other places overseas. "Romney advisers stressed that the holdings in the Caymans — along with those in a Swiss bank account that was closed in 2010 after an investment adviser decided it could be politically embarrassing to Romney — were reported on tax returns and were not vehicles to avoid taxes," Reuters adds. Over the past couple of weeks, Romney has defended his wealth and his tax rate, saying that he would "not apologize for being successful." During last night's debate, Romney added that his tax bill is "entirely legal and entirely fair." 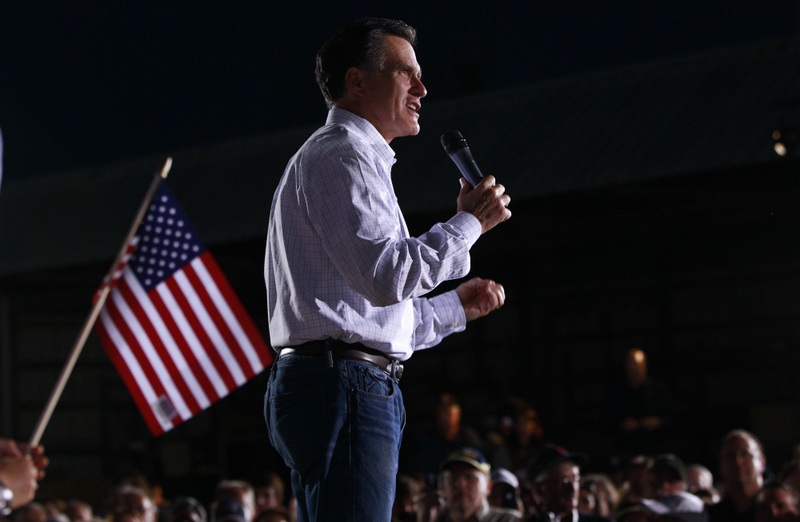 "You'll see my income, how much taxes I've paid, how much I've paid to charity," Romney said. "I pay all the taxes that are legally required and not a dollar more. I don't think you want someone as the candidate for president who pays more taxes than he owes." There were more than 500 pages of records released early this morning. So we'll update this story as we find more. Update at 11:26 a.m. ET. How Much Do Millionaires Usually Pay? The New York Times' Caucus blog is doing a stellar job of sifting through the data. They pick up on the 1 percent string. Romney's income puts him concretely into the upper crust of Americans. But how deep in? "According to the Internal Revenue Service's most recent available statistics of income, for 2009, there were 8,274 taxpayers with an adjusted gross income of $10 million or more, out of more than 140 million total returns filed. So anyone who makes more than $10 million would be in the top 0.006 percent of taxpayers. "With an adjusted income of more than twice that - $21 million - in 2010, Mr. Romney would be even higher in the income strata." NPR's Tamara Keith explained on Morning Edition that the average taxpayer pays an effective tax rate of 11 percent. That calculation takes into account deductions and adjustments to gross income. Add to that the payroll tax and Medicare tax and it pushes it above Romney's rate of 15 percent. So how did Romney's rates stay so low? As we alluded to earlier, it has to do with the fact that taxes on capital gains — or money that comes from stock dividends, investments and interest — is paid at a 15 percent rate. Tamara explained that Romney amassed great wealth during his time at Bain Capital "and now that money is generating more money and it's taxed at 15 percent."